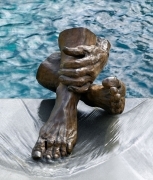 The sculpture aims to capture the tension between rest and restlessness. Whether one enters a state of tranquility or comes out of it, the rest is never complete, nor is it static. The process is in a continuous motion; nothing ever stays the same. Things to come are on the edge of one’s mind, threatening to invade the state of rest. And thus, “The Edge of Rest” is a metaphor for intrusion, as it is for ambiguity.